Switzerite: Picnic & Play: Whose Garden Is It? This morning we had another change in plans. I shifted the notes for Suzanne Down's clover story to tomorrow, so that we could take advantage of another flower! Lavender! 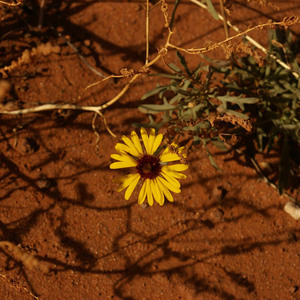 My thought has been to lead up to our first real Waldorf circle play (the "Sunflower Circle" from Movement Journeys and Circle Adventures: Movement Enrichment with a Therapeutic Approach for Early Childhood, volume 1 by doing different stories about flowers, after doing a story about the meadow. And we warped the loom and started to weave the meadow scene as well. So, as it turned out, today was a perfect chance to do lavender, because there's a lavender farm near me -- Shawnee Hills Lavender -- and today was one of their few U-pick days. And we will just do Clover tomorrow. It actually gives us an extra day to talk about bees and honey, so that's a good thing. 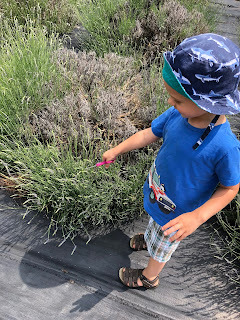 I focused on some things about bees because 1) I was hoping they would have lavender honey in their gift shop and 2) I didn't want Zac to be surprised when we saw a ton of honeybees buzzing around the lavender when we were cutting it. 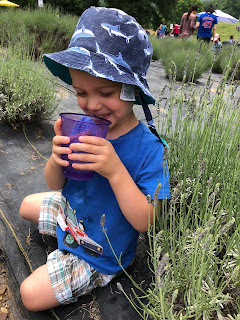 When I told Zac we were going to leave for the lavender farm he was quite surprised -- he felt jarred out of the magic of the circle -- and so that tells me that I needed a song to either wrap up the circle or to help us put on our shoes to go out the door. 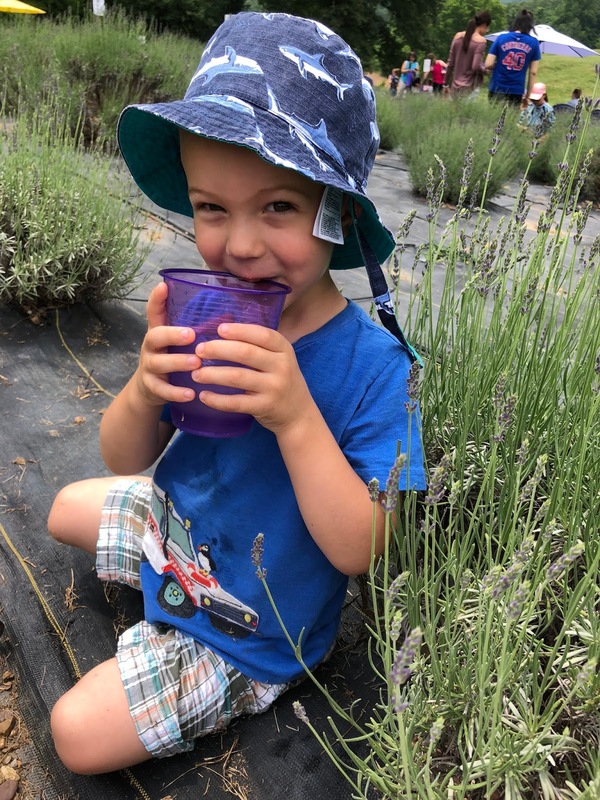 I realized the other day when we were walking out to the digging pit to fill it full of water with our watering can that we needed a song. As I tune in more to the Waldorf way of carrying the rhythms of the day with song, I can see where a song is needed (or wanted). I'm not prepared to write verses about a mud pit, so if anyone has a happy "we are about to dig in mud" song, please share! As far as one for putting on shoes to go on a journey, I'm sure Candy Verney has one in The Singing Day. 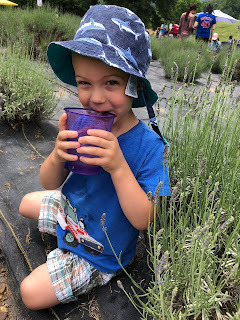 A few notes about the lavender farm, for my friends who may be planning to do this or for when we ourselves visit again. They have a portapotty. Always good to know! There are chairs and tables and sunshades, so it would be a good place for a picnic lunch. Zac wanted us to stay longer longer than the hour we were there, and I was sorry I hadn't packed a lunch. The cost is $5.00 per bundle (all you can fit in a twistie-tie) and they give you a cardboard box, clippers, and twistie-ties when you get there. I brought a pair of toddler scissors for Zac. 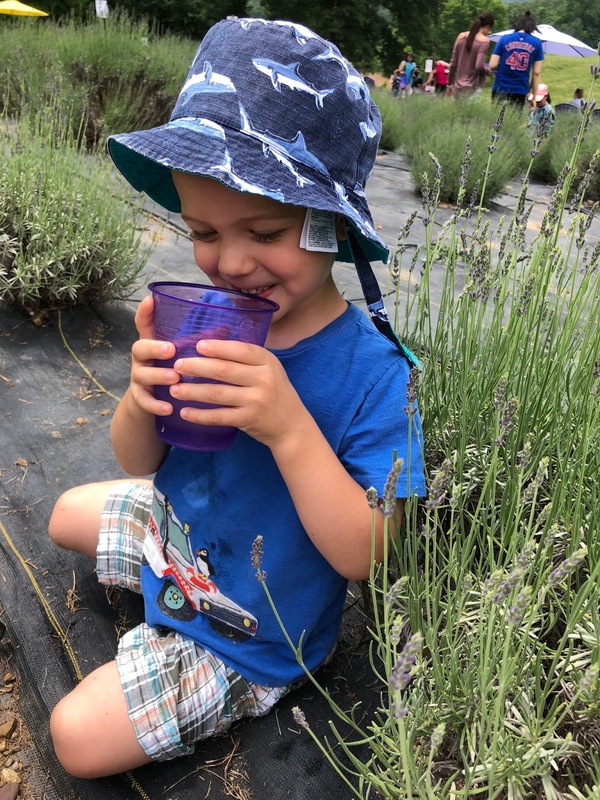 It is $1.00 for a glass of lavender lemonade (worth it) and you can pay in cash or get tokens from the gift shop if you need to use your card. The lavender plants are labelled as to variety and the ones which are culinary are clearly marked. 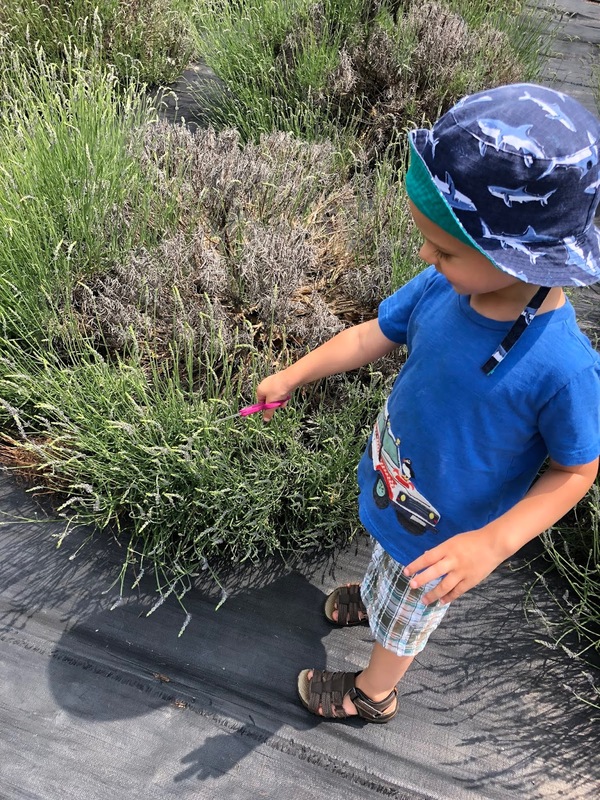 However, you can choose lavender for scent and still go away with some for culinary because they sell dried lavender for cooking in the gift shop. They did NOT have lavender honey. I was disappointed... Williams-Sonoma used to sell lavender honey from France and it was amazing. They give you instructions for how to cut properly when you get there, and they tie it up for you in bundles for hanging and drying when you pay. 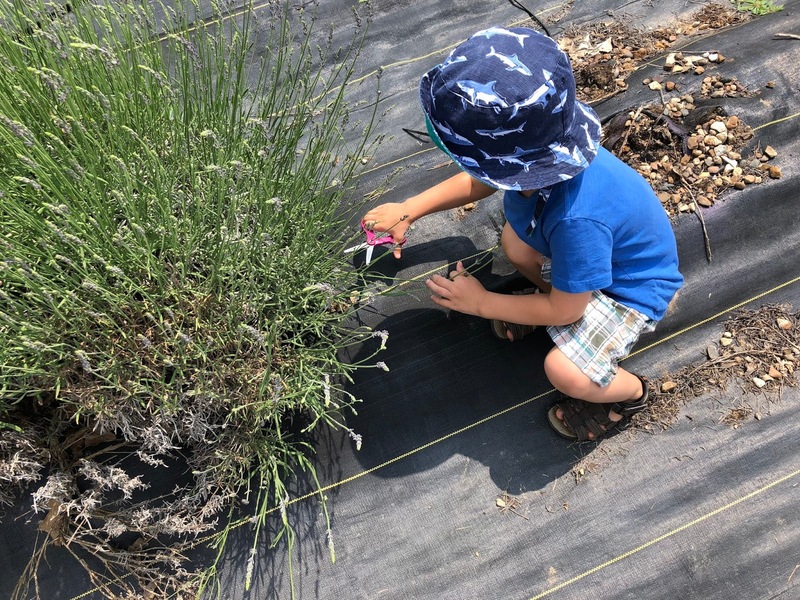 Whole lavender plants are also for sale. Next time I would like to get some for my rose garden. 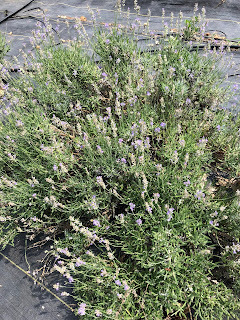 Roses and lavender are supposed to be nice companion plants. Take old rte 13 almost to Murphysboro and then hang a left on 127. That's the best way to get there. We tried to take 51 and it was a disaster and we got very lost. Siri was a little out of her element in the back roads of Cobden. 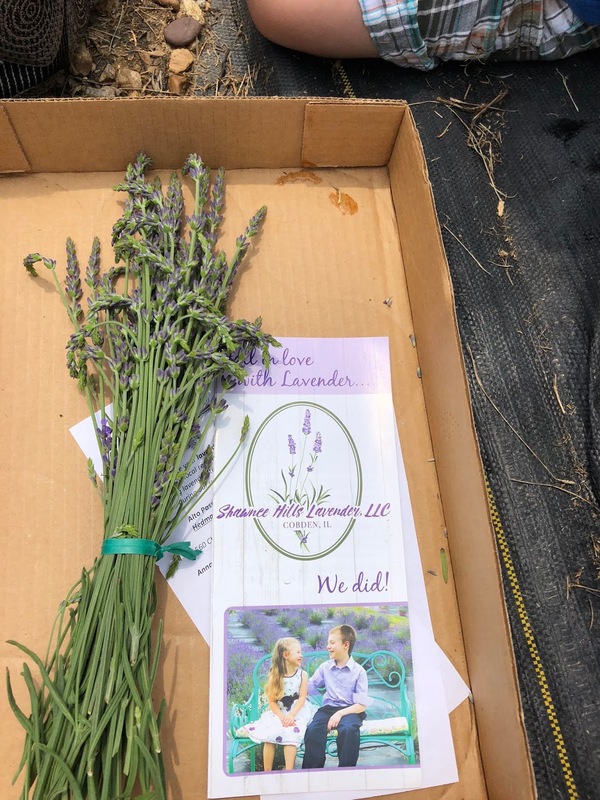 They have a list of local restaurants which carry lavender items on their menu. I went with Zac to Cristaudo's to see if they had shortbread lavender cookies, but they only had tea and a lavender simple syrup. Disappointing. 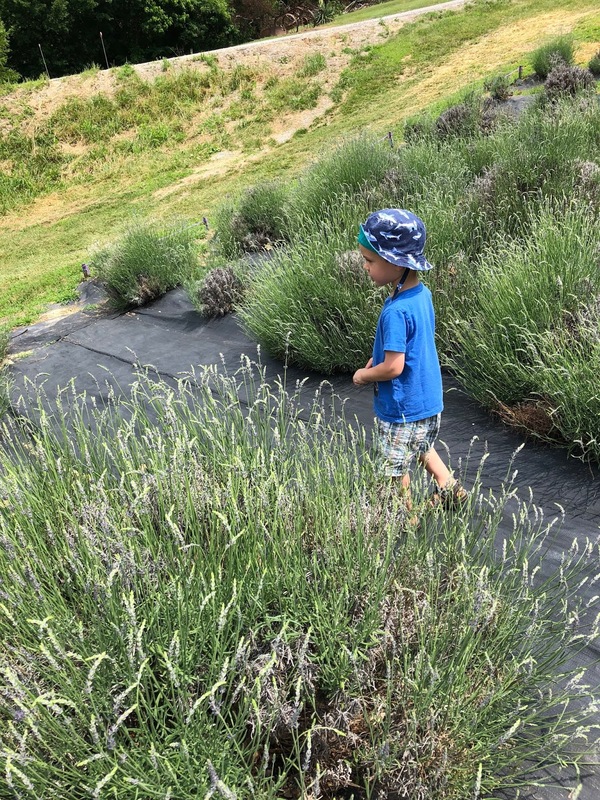 I guess I'll have to go back to Seven Oaks Lavender Farm again. Or maybe I can get their recipe!